There are lots of reasons why you might need to list all products on a single page of your WooCommerce website. For example, maybe you want to create an index page listing your entire inventory. Maybe you don’t like the way products are listed on the main WooCommerce shop page, and would prefer a WooCommerce list view. Perhaps you’re building a WooCommerce order form and want customers to be able to quickly select products from your whole range. I’m going to tell you how to use our bestselling WooCommerce all products list plugin to display all products in a table. And it’s not just any table. Your all products table can contain whatever product data you like, with user-friendly extras such as search box and filters. Unlike some WordPress table plugins, it will even be fully responsive and work beautifully on mobiles and tablets! Keep reading and I’ll tell you all about it. What is the WooCommerce all products list plugin? You can list all products in a table using the WooCommerce Product Table plugin. This popular plugin takes the products already in your WooCommerce store, and automatically lists them all in a flexible table layout. Choose your table columns – The product list plugin supports all the standard WooCommerce product data. Each piece of data can be listed as a separate column in the all products list. You can keep it simple and just list all your WooCommerce products with a column for the product title and nothing else. Or if you prefer, you can add extra columns for other product data, and even extra columns for WooCommerce custom fields and taxonomies. This makes it a very powerful way of listing all your e-commerce products. One-page order form option – If you just want to list all products for information purposes, that’s fine. You can create a basic WooCommerce list view, either with links to the single product page where people can purchase, or with no links at all. Alternatively, you can include an add to cart column in the list of products. This column converts your product list into a fully fledged WooCommerce order form, complete with variation dropdowns, add to cart buttons and quantity arrows. Improve the look of your product listings today! Let customers search and filter the all products table – If you have a large product inventory, then you’ll want to add extra controls to help customers find specific products. WooCommerce Product Table comes with an optional search box. You can also add filter dropdowns above the all products table and/or sidebar filter widgets. Customers can click on column headers to re-order the list of products. This makes it quicker to find products compared to the standard WooCommerce store layout. Set the order of the all products list – By default, the plugin lists all WooCommerce products with the most recent first. You can change this and order in other ways, e.g. alphabetically. Choose pagination styles and how many products to list per page – Your WooCommerce product table will list all products on one page, but that doesn’t mean that you want them all visible at once! Control how many rows of products to list on each page of the table. 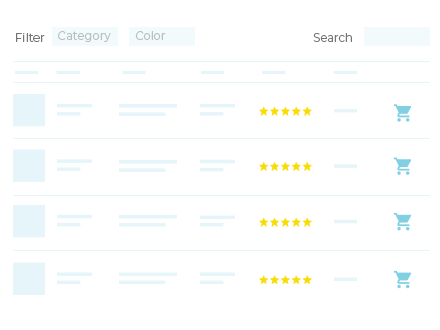 Choose from 4 pagination styles to display page numbers and previous/next buttons. List unlimited products – With a one-page product list plugin, you’re potentially loading far more data at a time than the default WooCommere layout. WooCommerce Product Table makes this possible as it has a lazy load option. By activating lazy load, your all products list loads 1 page of products at a time. This keeps it loading quickly, even if you list hundreds or thousands of products. Optional quick view – WooCommerce Product Table has a sister plugin, WooCommerce Quick View Pro. 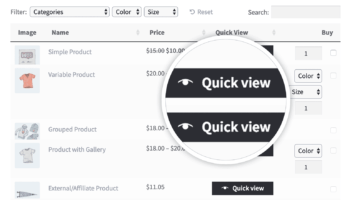 Use both plugins together to add ‘Quick View’ buttons to your list of products. Customers can use these to view extra product data and images in a lightbox, without having to visit the single product page. Before you start, you should have a WordPress website with WooCommerce installed and all your products added. Buy WooCommerce Product Table and install it according to the instructions in your confirmation email. In the WordPress admin, go to WooCommerce > Settings > Products > Product tables. Add your license key and read through all the settings, choosing the ones that you want for your WooCommerce all products list. Now create a page where you want to list all products in a table (Pages > Add New. Add a shortcode to your page: [product_table]. Publish the page and view it. You’ll see a list of all your WooCommerce products, professionally presented in a neat table layout. Well done – you’ve created an all products table in just 5 simple steps. Nice! What if I don’t want all products in the table? This article is about how to use WooCommerce Product Table to create list all your products. If you want to choose which products to list, that’s fine too. The plugin has plenty of options to list products based on category, tag, and various other data. How will you use this WooCommerce all products list plugin? As you can see, it’s easy to use WooCommerce Product Table to list all products in a neat table view. Spend some time experimenting with the plugin options and getting your all products list exactly how you want it. I’d love to hear how you use the plugin to list all products in a table. Do any of the use cases that I listed above apply to you, or are there others I’ve missed? Please leave your comments below.